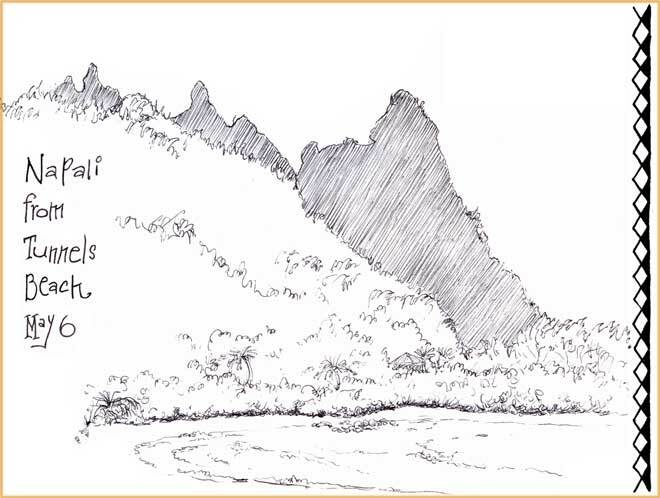 This sketch journal records an eleven day sketch journaling vacation on the lovely tropical island of Kauai, the northernmost island in the Hawaiian chain, and home of the humuhumunukunukuapua'a (that's the triggerfish, below). (click on an images for a larger view). The detailed tutorial (see here ), opposite every page of this lavishly illustrated sketch journal not only describes the circumstances surrounding the creation of each page, but also why Irene chose the sights and scenes she sketched and journaled what she did to fix booboos, correct misspelled words, offering advice that you can use in your own sketch journal next time you go out. If you've ever wondered what Kauai is like, this tutorial, full of photos, will give you a close-up and intimate look at the setting for a naturalist's adventures on a tropical isle. When you download your copy, you'll discover that each page of the sketchbook is reproduced life size, so you can examine it in detail. In the tutorial you'll get a chance to see what it looked like when Irene did the original sketching/painting,then what she did (if anything) to tweak it to its final appearance. 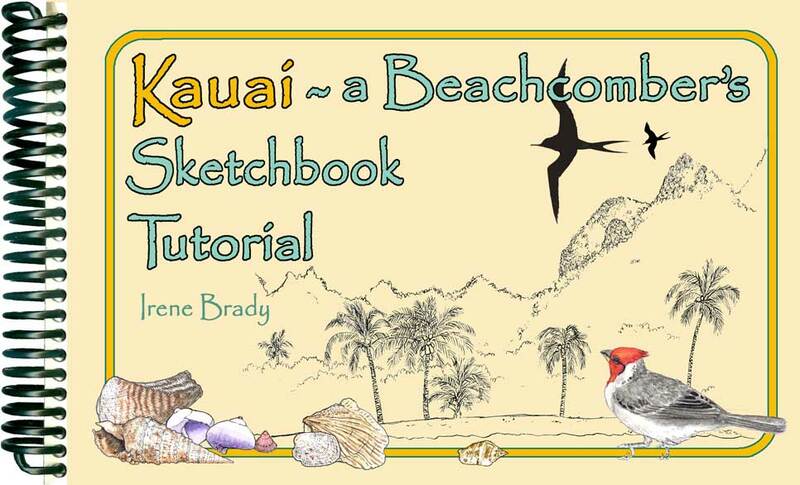 There is advice on sketching pleine air on the beach, putting long airport layovers to good use, and decorating pages before you leave to give you a head start on a well-balanced layout. You'll be amused at some of the techniques used and problems overcome, and you'll want to try some of the ideas next time you add a page to your own sketch journal. Come and have fun on the warm, misty beaches of Kauai in May (before all the tourists show up!). (Here is what an actual page and its tutorial from the journal look like. Scroll down if you only see one page. This travel journal is in the form of a PDF which you can download with Adobe Acrobat, save to your computer, and print out immediately on 8½ x 11 paper (heavy paper is recommended). COPYRIGHTED © 2011, by Nature Works. All rights reserved worldwide.